This is a review for Hairobics All Natural Hair Vitamins. The manufacturer claims Hairobics All Natural Vitamins not only promotes hair growth but also stops dandruff, something most other products for hair growth do not claim. They further claim to prevent hair loss in the first place. To learn more about Hairobics All Natural Hair Vitamins’ ingredients, guarantees, possible side effects, price and if it’s the right product for you, read on. The main active ingredients in this product are the B vitamins, C vitamins, and E vitamins, zinc, iron and folic acid. The B vitamins work to make hair growth healthy. Vitamin E helps by increasing oxygen, making hair fuller. Zinc encourages hair growth, and fights bacteria. Iron sustains strength and health in the hair. Folic Acid helps stop the loss of hair. It is recommended to take two tablets each day. The tablets should be taken with food. The website gave no information about possible side effects. Research showed no complaints of side effects from this product. If you are allergic to any of the ingredients you should not take this product. Signs of an allergic reaction are trouble breathing, rash, or vomiting. If any of these symptoms occur you should discontinue use and see your physician. The price of a bottle of 120 tablets is $24.99 plus shipping and handling. The manufacturer gives you thirty days to return the product of you are not satisfied with the results. They will issue a full refund, minus shipping and handling, once you send in the unused portion of the product. 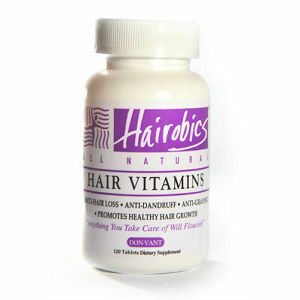 Hairobics All Natural Hair Vitamins contains many of the ingredients known to help hair get healthy and stay that way. The B and E vitamins as well as biotin have been proven helpful in the battle of hair loss. After research for consumer feedback, it was found many of the people left positive reviews. The product not only made hair grow for the majority of them, but also improved their overall health. The negative feedback was scant, and most of the users who left negative feedback complained of little to no results. 120 tablets gives you enough supply to last two months. The thirty day money back guarantee is a bit disconcerting as the consumer must take this product for up to four months before results can be noticed. After research, no information could be found about where the product is manufactured. It is also not apparent from any source if this is a vegetarian friendly product. The manufacturer makes no claims concerning quick results from Hairobics All Natural Hair Vitamins, and this product takes about four months to start giving users noticeable results, if any. John Brownstone	reviewed Hairobics	on August 3rd	 and gave it a rating of 3.